I'm obsessed with chandeliers, and have quite a "collection." So, let me introduce you to the chandeliers in my life! Above is the crystal and tole chandelier in the dining room. I know, it's a little over the top! I bought it when I was in love with all things tole. This is the French crystal chandelier in the entry. I found it at the Hillsborough Antique Show years ago. Love the crystal ball! It's interesting that when we bought this house, there was only one chandelier--in the dining room. Everywhere else, there was a new flush mount fixture. In a 1906 house? Needless to say, it has been fun finding chandeliers and sconces to replace what we inherited. 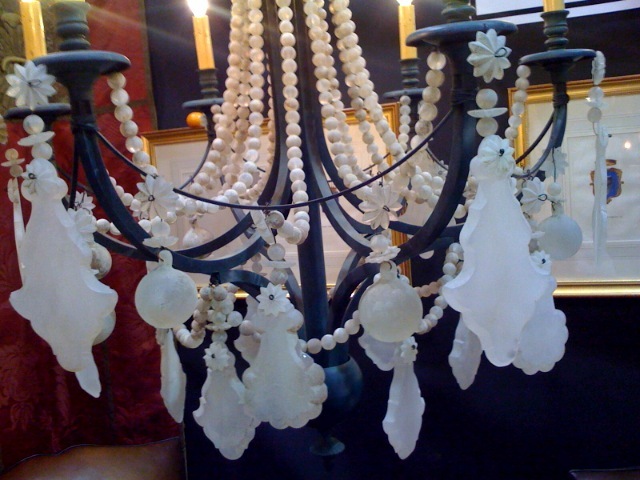 I found this vintage Italian tole chandelier at an estate sale in San Francisco. It is perfect for the sunroom. In the guest bedroom hangs this chandelier which I refinished myself. It used to be brass until I spray painted it white! My obsession with chandeliers also includes sconces. Especially ones dripping with crystals like this one in the living room. In the kitchen, this tole basket chandelier hangs over the table. And this little vintage fixture hangs over the kitchen sink, casting an amber glow. This is the iron pot rack fixture over the kitchen island, dressed in little vintage provencal fabric shades. In the upstairs hallway hangs this lantern that we found while antiquing in the wine country on New Year's Day. It replaced the existing fixture which now hangs in the new "reading room." Speaking of the wine country: here is an over sized lantern that hangs in our living room in Asti. It came with the house, and I do like it. However, I feel there is another one that is waiting to be discovered. The room is wired for an electric chandelier, but we opted for candlelight instead. Here is son-in-law Jason doing the honors of lighting the candles. Even the sconces are candlelit. This is what I'm really in love with now: This big burlap pendent hanging over the kitchen island. You can read about how we installed it here. There are even more chandeliers in the garage! I bought them at flea markets, estate sales or junk stores for resell back in the day when I was an antique dealer. This one is a vintage tole piece that I hope to someday find a place for. This poor chandelier is French and used to hang over the kitchen table until I replaced it with the basket tole piece. It's now a reject! Which brings us to this one: my header picture. I think about hanging it in the dining room, creating a simpler look. The best part about it is the crystals. They are acid washed to create the opaque look seen here. The body is a dark green. It needs to be rewired and there isn't any chain or cap. It would be a project. Can you see it in the dining room? With a white linen chain cover? As I mentioned a few days ago, Kim at Savvy Southern Style gave me an award! I grew up in Oregon, living the first 28 years there until moving to California for the second 28 years. My husband and I have four grown children. Only one still in college. We also have two little granddaughters. And one dog! Gardening is one of my passions. I love creating gardens for my friends and clients that are easy to take care of and won't cost a fortune to do. I'm lucky to have a wonderful gardener friend, Martin who has helped me with my projects since 1985! I used to be an antique dealer. I had a space in an antique mall for years but retired a few years ago when Ebay got so big. It is in my blood though, and will eventually get another space or storefront so I can sell all that stuff in my garage! Flea marketing and antiquing are one of my favorite things to do. I'm lucky that Mr. A enjoys the thrill of the hunt too. I'm very excited that in a few weeks, I'm going to Roundtop, Texas with three of my dear friends. Travel is another passion of mine. My favorite place in the whole world is the South of France! Second is Italy. My biggest passion is Interior Design. I've always loved change, and enjoy the creative process of creating warm, inviting rooms for myself and others. Even when I was a child, I rearranged my bedroom and my parent's living room constantly! I was always painting something or sewing something. Or drawing house plans! What can I say? Thank you again Kim for the Beautiful Blogger Award! I will be sure to pass it on! read the other participants and what they have to share. Wow! I love your obsession! You have so many pretty chandeliers! I have a couple of light fixtures I want to replace with chandeliers, but have not found what I want. I am loving all of your chandeliers! I think my favorite is the one in your guest room that you painted white. That's very much my style. And I really love the burlap shade pendant in your kitchen, Burlap is becoming so versatile! Each one is so stunning and so unique they give each room their own personality! I loved them all! You do have quite an assortment of chandeliers. They are all uniquely beautiful in their own way. I love your sconces, too. Such great pieces. I love the tole chandeliers. I remember getting to choose one when my mom and I re-decorated my room when I was young - like 10 or 11 - maybe that's why I am so obsessed with decorating! You have quite the collection!! Oh my what a big collection of chandeliers. Love them all. So beautiful. I have only one at home. Thanks for sharing. I had to chuckle when I saw that you have a love of chandeliers..I love them too and right now I have two old ones in my garage that I can't bear to part with...I keep hoping I'll find a place for them. They are so beautiful and add such style to your rooms. Your collection is exquisite! I love the one in your kitchen with the red striped shades and then the red polka dot pot rack is divine! Love them all actually! What a beautiful collection. I especially like the first one. The acid wash chandelier is...sorry had to catch my breath..GORGEOUS!! Can I see it in your dining room? Are you kidding? I can see me & it on our wedding day living happily ever after! Can you tell I really love it? And the sunroom & kitchen chandies..swoonworthy..I could love those forever! All are beautiful. This such a great way to dress a room up!! I'm definitely into chandeliers, they really make a room come alive. I have a couple of crystal ones (dining room and guest room) but want more if I can talk my DH into it!! Your collection is amazing Delores - love every one and would like to sneak around your garage treasure hunting! I so love all your chandeliers,not sure which one is my favorite. In my newest dollhouse I have hung chandeliers similar to the ones you have. Believe it or, the prices were similar to life sized. I have always wanted a real candle chandelier. It would come in handy since we have many power outages during the summer months. My house was built in 1910 and when we bought it, it still had the original wiring. I kept some of the original fixtures. Very nice post as usual. Have a great weekend. I LOVE all of them! Gorgeous!! the pendant over your kitchen island, was a definite favorite of mine, so simple but beautiful. what a nice blog and gr8 post! That is quite an addiction! I really like the little one hanging over your kitchen sink...it is so unique. WOW...you have so much eye candy....indoors and out! The photos you took a night were breathtaking. I love to play around with my camera too, but you do a lot better job than me! I became a follower. You have too much eye candy to miss out on! My favorite is the French crystal in the entry. Wow that's quite a collection! You are a lucky girl! 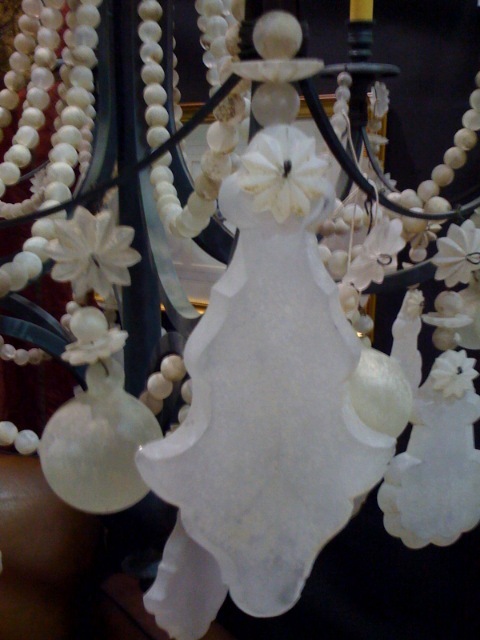 I enjoyed viewing everyone of your beautiful chandeliers and the way they compliment each space they occupy! Wow, that an amazing collection. I wouldn't even be able to tell you which was my favorite because they're all beautiful! I LOVE them all!! Every single one!! Just beautiful! And how lucky you are, going to Round Top!!! Have a wonderful time and take lots of pictures!! This post was such a highLIGHT!!! I WAS wondering about the one in your header....oh you have to get it working and hang it up...it would look great with the green wallpaper!!! I just loved the tour de Chandy! Thanks for sharing. I really adore the first over the top one. Just my style. I love to antique too and I've got a date Sunday with my friend Pat to visit a local antique shop or two or three. How wonderful and what a beautiful collection! Found you through Cindy's. I love the one you painted white..getting ready to do the same to one of mine. Noticed you like to decorate with books...I've got a giveaway going on at my blog; feel free to check it out if you'd like. Again, lovely! Totally loving your chandeliers which reminds me I need to find one for above the kitchen table! Absolutely lovely all of them! I also have quite a few hanging lamps and chandeliers. I just finished another lampshade. I really enjoyed your post!. Really enjoyed looking through your chandelier collection. From a fellow chandelier addict THANKYOU! gonna have to get going on my back yard tho, after gazing at your images!! you are girl after my own heart! I love your collections! all of them! Your blog is so fun to read :) Please post your adventures of Round Top for us! I have been going down there to help my aunt at the Marburger show for years.. sadly not this year. Have a fabulous trip! Not one of these chandeliers do I not like! They are all gorgeous! I love amber and I'm knowing that the one you've got in the kitchen with the amber bulb must be stunning when turned on! I know, at least for myself and my little old camera, that I couldn't capture the light they produce. I just love that amber glow. Great collection! I really like the first one! I don't think it's over-the-top. It's gorgeous. The one with iron pot rack fixture is lovely, too. I have this thing for hand forged iron chandeliers myself. It's really fun to redecorate old and new chandys and sconces.